We've been linking to YouTube video reviews of some of the cars that are being considered for our Fun Car Shopping challenge. These aren't the only cars in contention for -our- hard earned dollars, but give you an idea what you can get into for significantly under the 30k average new car price. For instance, we have seen one example of a Pontiac Solstice GXP coupe for $22k...for a car that was build in very limited numbers and could be considered a future classic (potential a down-side if you plan to really drive a car from this list). 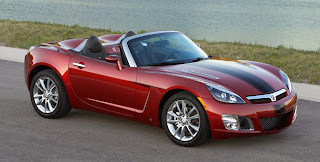 A Solstice GXP or its Saturn twin Sky Redline, both in convertible forms, fall in the mid-teens and are often un-molested (but have a fairly limited selection of performance parts to choose from - if you plan to not leave your sports machine stock). On the more expensive side of the spectrum, you can get into a real track warrior like the Lotus Elise for mid-20k money. Just plan to have access to another, less hard edged, car for longer drives. In between there are cars like the perennial Mazda MX-5 (offered in both soft and hard-top in the newer models) for high-teens money. Honda's S2000 is available in our target price-range and has a bit more room than the Mazda and is a bit sportier still. 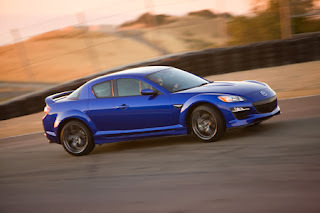 Finally, in this initial list, for those looking for more practicality and less wind in your hair, there's the Mazda RX-8. The only car to offer the quirkiness of the Wankel rotary engine, the RX-8 has a screaming 9k redline as well as seating for 4 normal sized humans. Just be prepared for the other quirks of rotary ownership...namely a thirst for petrochemicals in their various forms. Getting into the 20's in mpg is considered a badge of honor in the rotary world. Rotaries also, much like a 2-stroke piston engine, burn oil as part of their normal operation. Accept these thirsts, and the RX can be a great all-rounder for someone who wants a sports car but has a family to consider. Additionally, the RX is offered in normal and R3 trims (2009-2011 models only) that allows you to choose a more sedate drive vs a more track-focused model. So, in the coming weeks, we will be trying to get seat time in some of these models and write more in-depth reviews to help identify each model's strengths and weaknesses.